‘Such an awkward length,’ commented Jonica. diversion: we have discussed the question of US/UK usage of ‘knickers’ before. This is an extreme case – an English girl going out to dinner in her vest and knickers is in her underwear (perhaps with suspenders too). In which case obviously she would be in the Dress Down Sunday feature of the blog. The young people are on their way to an outing on a boat, one of the great setpieces of the book, with dreadful things going wrong, plus sharp descriptions of everyone’s clothes. Links up with: Two earlier entries from this book. This First Lady wore a fur jacket, and Lord Peter gives Harriet a fur here. 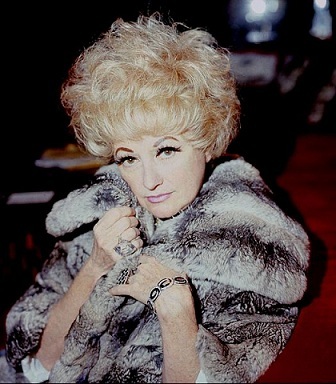 The picture is of comedienne Phyllis Diller in a chinchilla coat.